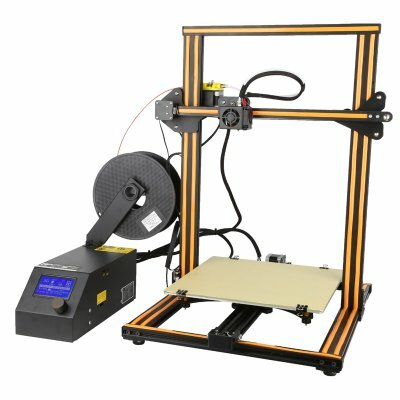 Successfully Added DIY 3D Printer Creality 3D CR-10 - LCD Display, Large Building Volume, Wide Filament Range, High Precision Printing to your Shopping Cart. This 3D printer is the Creality 3D CR-10 - a great starter kit for those of you that wish to enter the unlimited world of 3D printing. This DIY kit comes with a detailed manual that guides you step-by-step through the assembly process. Your 3D printer features a simple and lightweight design, making it easy and fast to put together. Therefore, you won’t need any technical knowledge to build this 3D printer. This makes the Creality 3D CR-10 perfect for people with any background. Whether you’re an engineer, artist, hobbyist, or teacher – this 3D printer is sure to bring along hours’ worth of fun and creativity. By supporting a wide-range of 3D printing filaments, it lets you customize your upcoming art projects to your own liking. Its 0.4mm nozzle is extremely accurate and delivers beautiful and detailed end products. Your printer itself has been built out of high-end aluminum parts. This provides you with extra stability while printing – further increasing the quality of your 3D printed objects. If you have always dreamt of designing and creating your own tools or 3D art, this DIY printer kit is the perfect gizmo for you. With its 300x300x400mm building volume, it lets you create large-sized objects without encountering any limitations. Your 3D printer supports different file formats and comes with an LCD display and keypad for easy offline usage. Additionally, it also allows you to print files straight from your SD card or USB stick. Whether you’re a hobbyist, designer, or professional artist, the Creality 3D CR-10 3D printer treats you to unlimited possibilities. From now on, you’ll be able to create anything the mind can imagine with the simple press of a button. The Creality 3D CR-10 DIY 3D Printer comes with a 12 months warranty, brought to you by the leader in electronic devices as well as wholesale electronic gadgets..